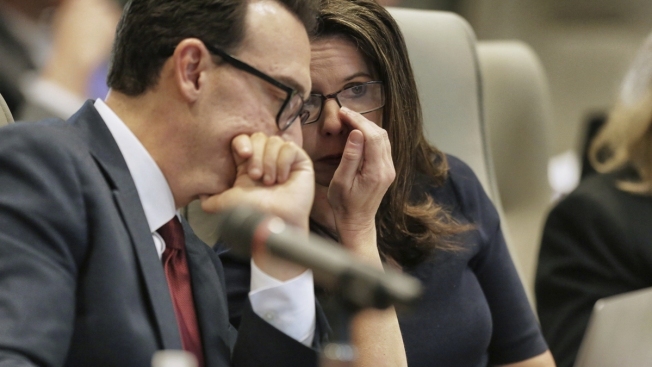 North Carolina Board of Elections Executive Director Kim Strach, right, talks to general counsel Josh Lawson during a public evidentiary hearing on the 9th Congressional District investigation at the North Carolina State Bar in Raleigh, N.C., Monday, Feb. 18, 2019. The North Carolina political consultant hired to manage the campaign of the Republican in the country's last unsettled congressional election said Tuesday that he was surprised at how little he knew last year about an operative's sketchy activities. Political operative Leslie McCrae Dowless conducted an illegal and well-funded ballot-harvesting operation last year, North Carolina's elections director testified Monday. Dowless' workers in rural Bladen County testified at a special state elections board hearing that they were directed to forge signatures, collect blank or incomplete ballots voters handed over, and even fill in votes for local candidates who hadn't earned them. Dowless was hired to work for Republican congressional candidate Mark Harris last year and focused on boosting mail-in votes for the GOP candidate in the 9th Congressional District in south-central North Carolina. Harris said he sought out and hired Dowless because he secured votes , including for a Republican rival in the 2016 GOP primary. Harris narrowly leads Democrat Dan McCready in unofficial results. But the race wasn't certified in November after allegations involving Dowless' operation focusing on mail-in ballots. Harris is expected to testify Tuesday. The elections board is expected either to declare a winner or order a new election after the multiday hearing wraps up. Harris had decided to deploy Dowless before Andy Yates and his firm, Red Dome Group, began working for the Republican's campaign. Yates said he was instructed to pay Dowless but said he didn't know about legal trouble Dowless faced after the 2016 general election. That was months after Republican congressional candidate Harris lost a primary election to incumbent Robert Pittenger and discussed with an attorney whether to challenge Dowless' amazing results for a third GOP candidate. Republican officials never signaled the risk of trouble ahead, Yates told the elections board under questioning. They didn't inform him that Dowless' work collecting mail-in ballots in 2016 was sent to federal prosecutors for potential criminal prosecution, Yates said. 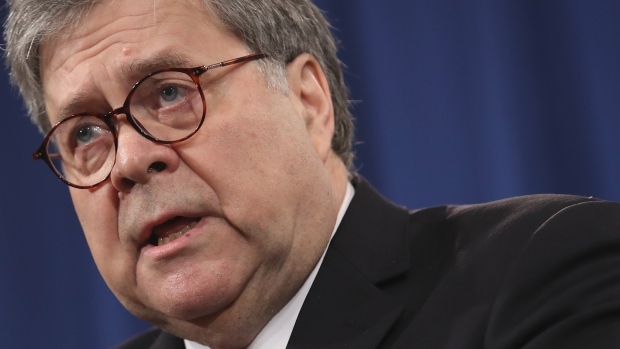 Yates said he also didn't know about complaints Pittenger reportedly raised about Dowless' suspicious work to the state and national Republican Party officials after May's primary, when Harris beat the incumbent, Yates said. "It shocks me that they didn't," said Yates, adding he thought GOP officials had an obligation to warn him about Dowless. Yates testified he told state Republican Party Executive Director Dallas Woodhouse the day after the primary that Dowless was working for Harris, and Woodhouse raised no red flags. Woodhouse told reporters after the hearing that losers in party primaries often voice complaints, but the party machinery can't get involved in intra-party campaign spats. Woodhouse said when nothing happened to Dowless after accusations of 2016 ballot-harvesting were forwarded to prosecutors "it was my belief that everything was legal." Yates said he initially believed Dowless' history of delivering big vote results in Bladen County involved effective and legal methods. Yates insisted that had he known about Dowless' methods, Harris would have had to make a choice about cutting him or Dowless. "If Dr. Harris had told me he didn't know about it, I would have advised him that we needed to immediately terminate our relationship with Mr. Dowless," Yates said. If the Republican candidate wouldn't, "I would have told Dr. Harris that I need to resign from the campaign."